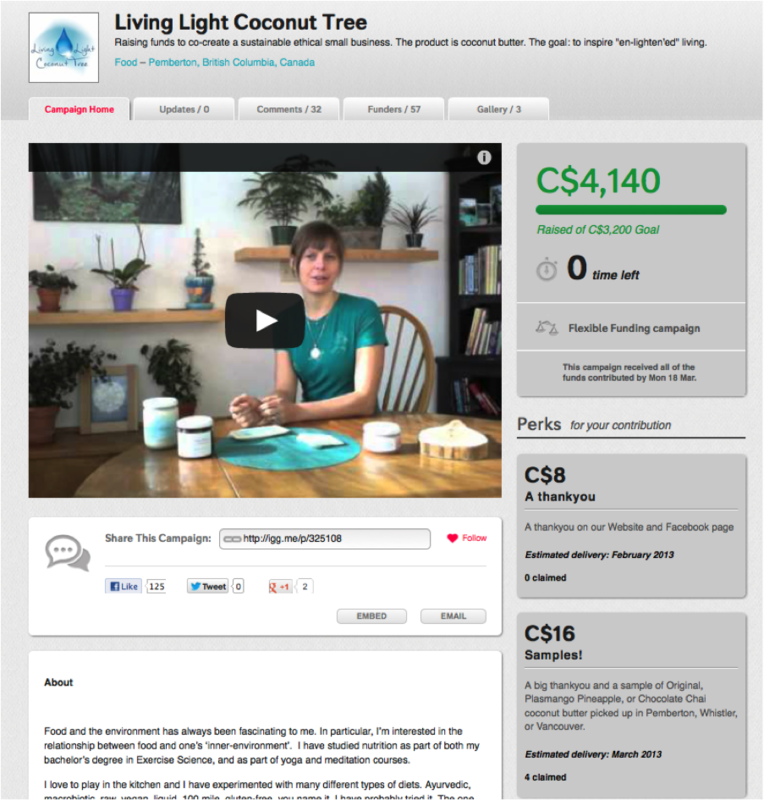 For this blog post I’m thrilled to feature my dear friend Rya and her awesome coconut butter business Living Light Coconut Tree. Rya’s story is really inspirational. We were returning together from one of our spirituality workshops down in Florida and in transit started chatting about Rya potentially starting a little coconut butter production business. We were brainstorming flavours and fun names for them during our layover, I offered a few marketing tips and mentioned that the whole crowd source funding thing might be a good option for her on the train ride home and next thing you know, what seemed to be a casual conversation became something tangible. Within a few short months, Rya was up and running. While many of us hem and haw over business ideas, and so many never find the courage to actually make that idea happen, Rya hit the ground running. So inspirational! So I’ve invited her here to share with us how she was able to build her business and how crowd sourced funding helped her get things off the ground. Thanks so much for taking the time to share your experience with us Rya! Could you tell us a little bit about your business to start? How did you come up with the idea? I always had an interest in food…its nutritional content, its taste and its effects on the body and mind. I love to play in the kitchen, and come up with fun healthy recipes. 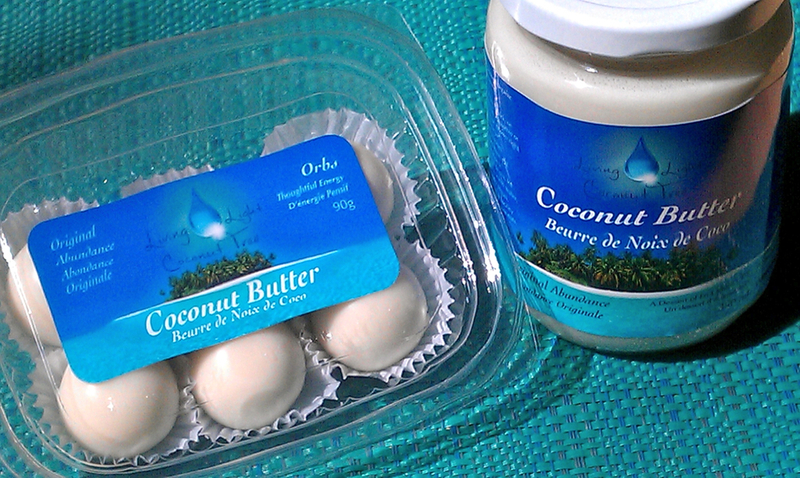 One food product of particular love was coconut butter. Not only were the health benefits amazing, but it tasted good. Every night I’d look forward to a few spoonfuls of coconut butter instead of dessert. I found it hard to find coconut butter in grocery stores, and wondered if maybe this is the food product I could actually make a business out of. The idea to make a solid go at it arose after an inspiring and empowering meditation and theoretical cosmology workshop in Florida. I had so much creative energy as I started to compile information on how to start a business. You, Martina, helped me to take the business from an idea into manifestation. You shared with me valuable points to starting a new business. To get things off the ground, you ran a successful crowd source funding campaign on Indiegogo. Can you tell us a little more about that experience and how you were able to reach your goal? What elements contributed to the success of your campaign? This was a really cool learning challenge and amazing experience. It set my business up for success right from the start. I was financially able to start my business without having to approach investors or the bank for a loan. It gave me incentive to come up with a prototype of my product and to practice selling my product. In the video, I wanted to explain the health benefits, deliciousness, and awesomeness of coconut butter in a simple catchy way. Most importantly, the campaign was fun to do! Believe in yourself and believe in your product. Write positive affirmations with respect to this so you keep your motivation and optimism strong. This will fuel you to keep promoting the campaign and sharing it with people. Create a fun video and perks that both the donors will love and will help with the growth of your business. When setting your target amount to raise be transparent with where the money will go. Factor in all costs. Interact with people that believe in you (ie. people who love your product, people who want to see you succeed, people who have expertise in areas that will help you). See the campaign as a Win-Win situation! I think that one thing that might hold people back from crowd sourced funding is feeling weird about asking people for money. How did you deal with that? I would go back to my positive affirmations. Also, there are perks for different amounts when people donate, so I focused on what the people donating will receive. I also hoped that the encryption of abundance I shared in my campaign would inspire abundance in the lives of people who donate (or even just read about my campaign). Click to tweet: Share an encryption of abundance in your crowd-sourced funding campaign to inspire abundance in the lives of donors. I know that you ended up changing your goal part way through your campaign. Why and was it easy? I realized part way through that my goal was quite high, so I looked at what I had budgeted for. The highest expense was the machine to make the coconut butter. I looked into smaller machines, and found a model that was still good quality, but much cheaper than the original machine I had wanted. I approached Indiegogo, and explained that I wanted my campaign to be a success, and that I had adjusted my budget so I could lower my goal. Since I asked to change the goal early enough in the campaign, they approved the change. So now that you have your business up and running, I wanted to ask a question related to the industry you’re in. I know from prior work experience just how challenging it is to get a new product on grocery store shelves. How did you go about this? The initial confidence I gained from my campaign’s success helped a lot! A solid product and brand was foundational. Once the recipe was down, the next thing was to co-create a catchy logo. Kate Stoker, from Stoker Designs did awesome! Then, I started local and approached stores that supported local products. I went to the local health food store in Pemberton, beNatural, where I shop. The owner was super supportive and stoked to carry my product. From this empowering experience, I expanded and went to local organic stores in nearby towns. Most were supportive, and some were not. I focused on the “yeses”. The first bigger store I approached was Nesters Market. I was lucky to have a friend who knew the manager, introduce me. The key to this meeting was that I knew my product. I knew the health benefits, shelf life, and details about the label and lab tests, since I had gone through the whole process myself to create the label and get the product approved to meet government standards. Since I am actually about to have a baby (since we did this interview, Rya has welcomed a beautiful baby boy, Tae Sequoi Hopkins into the world – congrats Rya!! ), the next step was to hire my first employee… my husband! So far he has been amazing. He plans to keep expanding the business and approach more stores in Vancouver, including Whole Foods. I have a game plan for expansion over the next few years, ultimately leading us to source the coconut from our own fair-trade organic coconut farm! Thank you so much for taking the time to be here Rya! Love your inspirational and empowering words. And be sure to sign up for Rya’s newsletter for the latest recipe updates and to join her blog community.